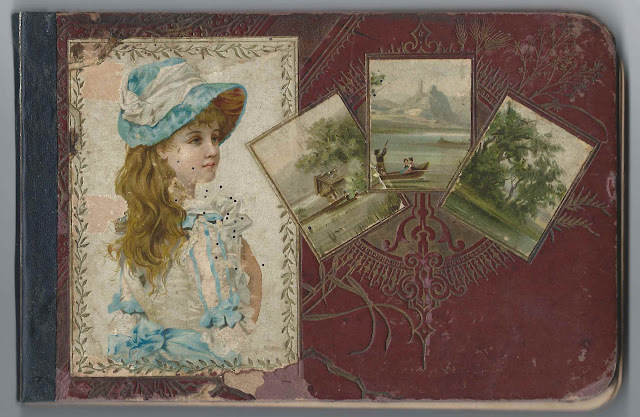 1880s/1890s autograph album of Maud, who was apparently a student at Carthage College, which was then located at Carthage, Illinois. I believe Maud lived at Fountain Green, Illinois. Some students spelled her name as Maude, but her roommate, Cora Hastings, who signed a page Elvaston, Illinois, on 18 March 1891, spelled it as Maud. If you have a theory as to Maud's surname and family, please leave a comment or contact me directly. The album is approximately 7-3/4" x 5" and contains the sentiments of 47 people, whose names are listed alphabetically at the end of this post. 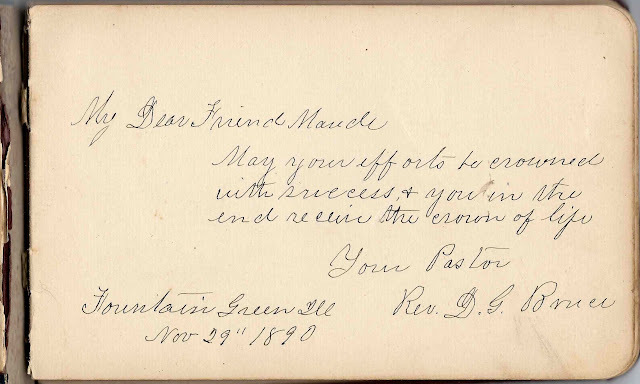 The first page in the album was signed by Maud's pastor Rev. D. G. Bruce at Fountain Green, Illinois, on 29 November 1890. Other members of the Bruce family signed pages as well. Saidee Connable signed a page at Carthage College on 21 May 1891. C. A. Mesick signed a page 21 February 1890 and sketched an intricate bird. Bertha Geddes signed a page at Fountain Green, Illinois, on 15 January 1890. She left a grim message: "Remembrance is a sin." 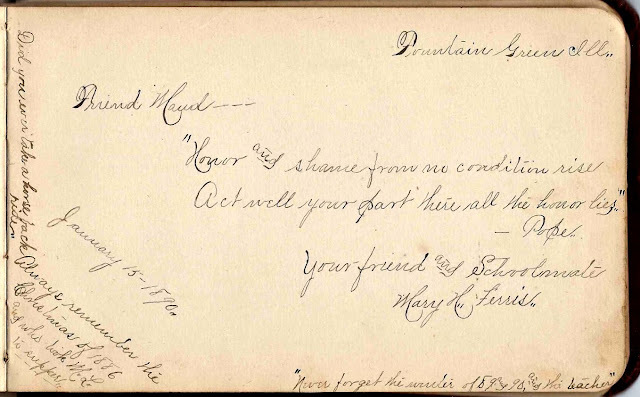 Mary H. Ferris signed a page at Fountain Green, Illinois, on 15 January 1890, and filled her page with memories. Cleophas C. O'Harra signed a page at Carthage College at Carthage, Illinois, on 7 May 1891. If you have information on Maude or any of the signers listed below, please leave a comment or contact me directly. Thanks! 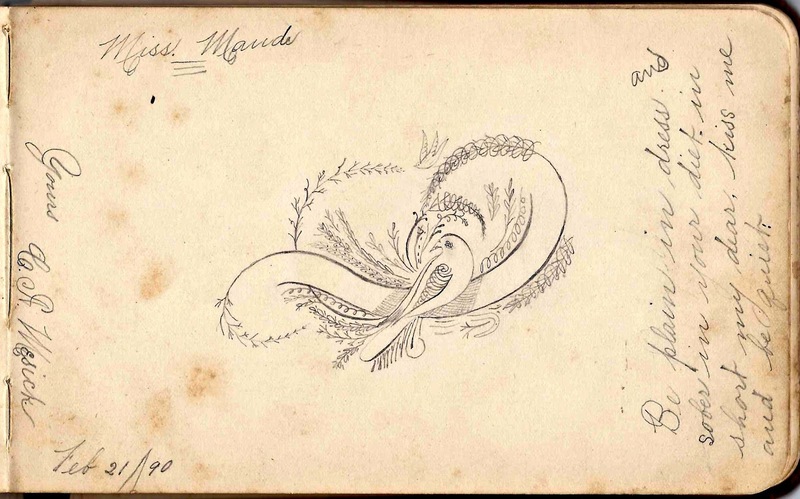 Maud L., signed at Fountain Green, Illinois, on 15 January 1890. "Friend Maude. 'The words of lovers are ike the rich wines of the South, delicious in their native soil, but will not bear transportation.' Never forget the Xmas of 1886 and the 'Young Man' who took me to supper. Remember our walnut candy. Truly, Maud L."
Ethel "May your life be long and happy." Lillie B. Allison [not sure of surname] "(alias) Frank Brown", signed at Fountain Green, Illinois, on 19 February 1890 "Dear Maude - 'Knowledge is a comfortable and necessary retreat and shelter for us in an advanced age; and if we do not plant it while young, it will give us no shade when we grow old.' - Lord Chesterfield. Your friend and school-mate"
Mary A. Bolton of Edmunds, Illinois, signed at Carthage, Illinois, on 13 May 1891 " 'How well does the song of a passing bird represent the glad but transitory days of youth.' "
M. Blanche Brokaw, signed at Knox, Pennsylvania, on 10 May 1893 "Dear Maude - 'To thine own self be true and it must follow, as the night the day That then thou canst not be false to any man.' - Hamlet. Yours lovingly." 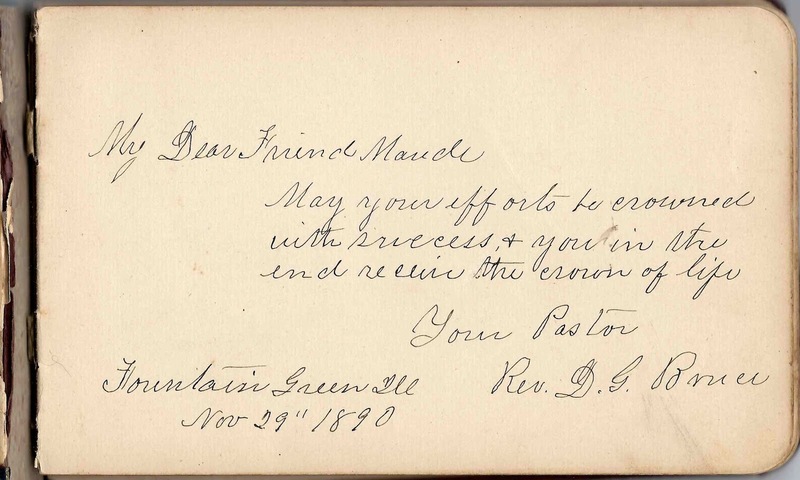 Reverend D. G. Bruce, signed at Fountain Green, Illinois, on 29 November 1890 "My Dear Friend Maude, May your efforts be crowned with success and you in the end receive the crown of life. Your Pastor"
Will L. Bruce, signed at Fountain Green, Illinois, on 29 November 1890 "Friend Maude: - 'We have not wings, - we cannot soar, But we have feet to scale and climb, By slow degrees, by more and more, The cloudy summits of our time.' "
May Bruce of Fountain Green, Illinois, signed on 11 July 1890 " 'Friendship is like the sun's eternal rays; Not daily benefits exhaust the flame; It still is giving and still burns the same.' "
Mrs. M. E. Bruce of Fountain Green, Illinois, signed 27 November 1890 " 'Expect great things from God, and attempt great things for God.' "
George H. Callihan, signed at Fountain Green, Illinois, on 23 February 1890 "Friend Maude, When the golden sun is setting And your mind from care be free, When of distance friends you're thinking, Will you sometimes think of me. Remember the medley composed by L. B. A." 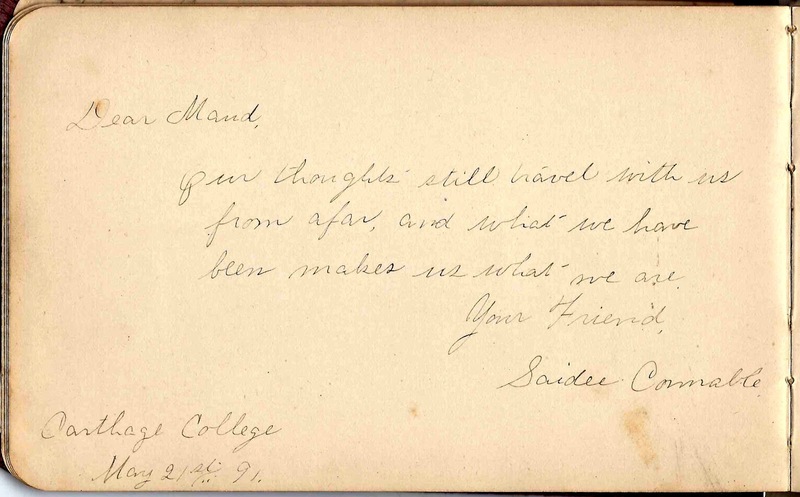 Saidee Connable, signed at Carthage College on 21 May 1891 "Dear Maud, Our thoughts still travel with us from afar, and what we have been makes us what we are. Your Friend"
Jennie Crump, signed on 21 January 1890 "Friend Maude, Precious book of charming grace, Gems of thought may here be cast, Names that time may not erase, Pleasant mementos of the past. Your schoolmate"
Carena Cutler, signed at Carthage, Illinois, on 3 December 1890 "Friend Maude, Friendship like an evergreen will bear the inclement blast, And still retain the bloom of spring When summer days are past. Your Friend and Schoolmate. Remember C. C. [Carthage College]"
Eva Cutler, signed at Carthage, Illinois, on 16 January 1889 "Friend Maude: May your life have 'just' enough clouds to make a glorious sunset. Yours, Eva Cutler"
Laura E. Dickerman of Mendon, Illinois, signed at Carthage College on 21 December 1891. "Dear Maude: 'Like a vase in which roses have once been distilled, You may break, you may shatter the vase if you will, But the scene of the roses will hang around it still.' Don't forget the walks after Physics"
Mary H. Ferris, signed at Fountain Green, Illinois, on 15 January 1890 "'Honor and shame from no condition rise, Act well your part; there all the honor lies.' - Pope" "Did you ever take a horseback ride? Always remember the Christmas of 1886 and who took M. L. to supper. Never forget the winter of '89 and '90 and the teacher. Your friend and Schoolmate"
Ella Connor Ferris, signed at Fountain Green, Illinois, on 16 February 1890 " 'Be good, sweet maid, and let who will be clever. Do noble things, not dream them all day long, And so make life, death and that vast forever One grand sweet song.' 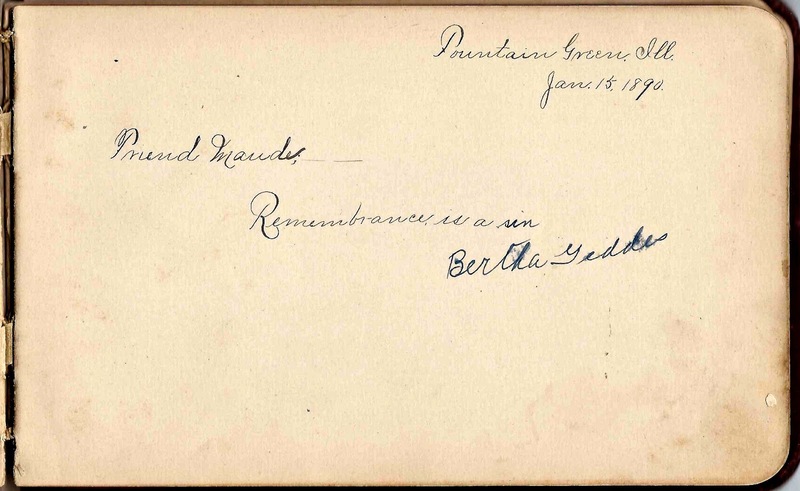 "
Bertha Geddes, signed at Fountain Green, Illinois, on 15 January 1890 "Friend Maud, - Remembrance is a sin." 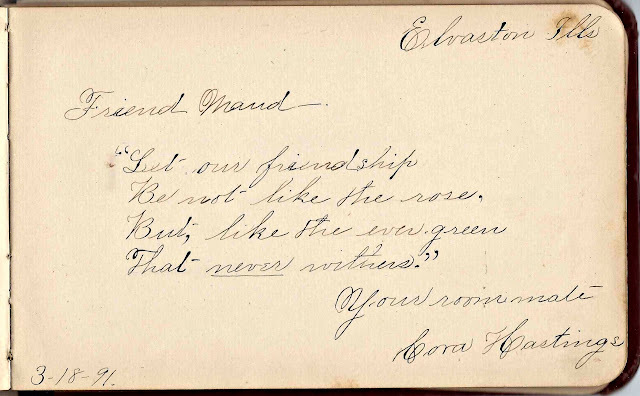 Cora Hastings, signed at Elvaston, Illinois, on 18 March 1891; Maud's roommate "Friend Maud - 'Let our friendship Be not like the rose, But, like the ever green That never withers.' Your roomate"
Mary Heitman of Yount, Missouri, in Perry County, signed at Carthage College in Illinois. "Friend and Schoolmate, Maud. In memories golden casket, Please drop one pearl for me. Your friend." Bertha L. Houston of Carthage, Illinois "Friend Maude: - 'In memories casket drop one pearl for me.' "
Rose Kirkpatrick of Canton, Missouri, signed at Fountain Green, Illinois, on 29 February 1888 "Dear Maude: - I see I am first of all your long list of friends to inscribe my name on this, your 'Tablet of Memory'. May none but the truest friends dare sully its pages with pretensions of that rare boon: - Friendship. Let this page be especially reserved for the memories of the winter of '87 and '88. With best wishes, I am Resp., Rose Kirkpatrick"
Cecelia A. Leach, signed 15 January 1890 at Fountain Green, Illinois "Friend Maude: May your days glide smoothly along, And may you as happy be, As the bird that warbles its free song Away in the wildwood tree. Your School-Mate"
Alice L. Marvel, signed at Carthage College, Illinois, on 7 January 1891 "Friend Maud, 'Be good, sweet child, and let who will be clever, Do noble things, not dream them all day long, And so make life, death, and that vast forever One grand sweet song.' "
Mollie Marvel of Bowen, Illinois, signed at Carthage College on 13 December 1890 "Your friend"
Eva McClaughey, signed at Fountain Green, Illinois, on 16 January 1890 "Friend Maude: Count that day lost whose low descending sun, views from thy hand no worthy action done. Man's love is like Scotch snuff, Take one pinch and that's enough. Profit by my sage advice When you fall in love - think twice. Yours in aff." Grace E. McGaw, signed at Elvaston, Illinois, on 10 January 1891 " 'Our friendship has budded on earth; May it bloom in Heaven'. Sincerely, Grace E. McGaw"
Leila McMahan of Warsaw, Illinois, signed at Carthage College on 21 May 1891 "Ever your friend"
C. A. Mesick, signed 21 February 1890. Intricate bird sketch in the center with handwriting around the edges. "Miss Maude, Be plain in dress and sober in your diet. In short, my dear, kiss me and be quiet." 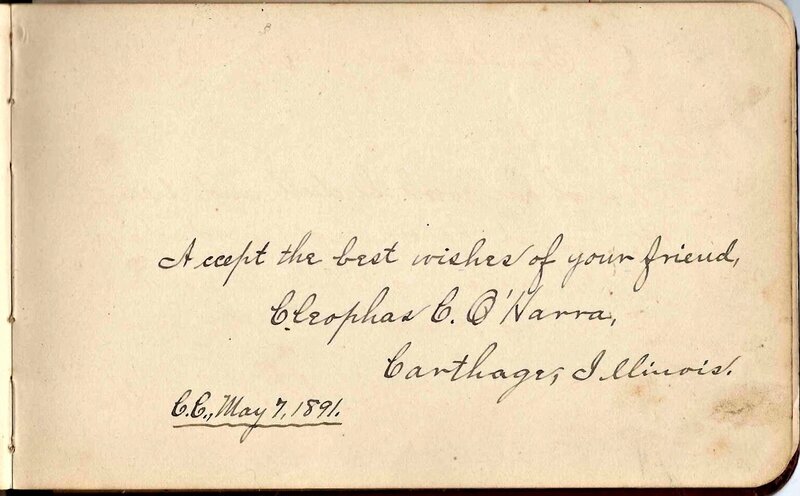 Cleophas C. O'Harra of Carthage, Illinois, signed at Carthage College, on 7 May 1891 "Accept the best wishes of your friend"
Gertrude Price of Irwin, Illinois, signed at Carthage College on 19 December 1891 "One line is sufficient for memory." Birdie Reaburn of Dewar, Illinois, signed at Carthage College on 21 May 1891 "Maude - In seeking friends, remember what Cowper says of Friendship: 'T'is a union that bespeaks reciprocated duties.' Your friend"
Grace B. Ridgeley of Elvaston, Illinois, signed at Carthage College on 8 May 1891 "Dear Maud - Love me little, Love me long, But never flirt, For it is wrong. Your friend" "Maud, don't blush." Myrtle L. Robinson, signed at Fountain Green, Illinois, on 17 January 1890 "at school". "Dear Maude. 'Vice is a monster of so frightful mien, As, to be hated, needs but to be seen; But seen too oft, familiar with her face, We first endure, then pity, then embrace. - Pope. Your Friend and School-mate"
Annie Sanford, signed at Clio Hall on 23 January 1891 "Friend Maude: Labor with what zeal we will, Something still remains undone, Something uncompleted still Waits the rising of the sun. Your Friend and Schoolmate"
Kate Sayre of Niota, Illinois, signed at Carthage College on 21 December 1891 "Education is not confined to books: the world is a great school." Mary Sayre, signed at Carthage College on 12 December 1891 " 'The little things we say and the little things we do are the warp and woof which, when woven in the great loom of life, come out the finished fabric - character.' -Plummer. Yours truly"
W. M. Snyder, signed at Fountain Green, Illinois, on 10 February 1890 "Miss Maud: 'Though our work be dull and dreary We must labor night and day; Never grieving but ever achieving, Scattering the evils that lie in our way." Mary F. Tyler, signed at Fountain Green, Illinois, on 16 January 1890 "Many a shaft at random sent, Finds mark the archer little meant; And many a word at random spoken May soothe or wound a heart that's broken. Your friend and seatmate"